The carbon-carbon bond forming reactions are of central importance in organic synthesis and routinely practiced across the world in both research laboratories and industrial processes. Since its initial discovery in 2004, graphene, a two dimensional nanomaterial bearing a single layer of sp2-hybridized carbon sheet with hexagonal packed lattice structure, has received significant attention worldwide. Owing to its exceptional physicochemical properties such as thermal stability, ease of structural modulations, high surface area leading to considerably high mass transfer as well as high loading capacity of nanoscale structures, and easy recovery and recyclability, graphene domain and/or graphene- based nanomaterials (G-NMs) can be considered as the materials having a self-assembly of very likable or ideal properties for catalytic applications. Not surprisingly, therefore, the last few years have witnessed the significant progress in the fabrication and exploration of a variety of G-NMs as alternative heterogeneous or pseudo-homogeneous catalysts in organic synthesis. This review highlights the significant advancements in the synthesis and an up-to-date catalytic applications of G-NMs in carbon-carbon bond forming reactions with an emphasis on coupling reactions. Keywords: Heterogeneous catalysis, carbon-carbon bond formation, nanomaterials, graphene, graphene oxide, reduced graphene oxide, C-C coupling, organic synthesis. Affiliation:Department of Chemistry, National Tsing Hua University, 101, Section-2, Kuang-Fu Road, Hsinchu 30013, Taiwan (ROC). 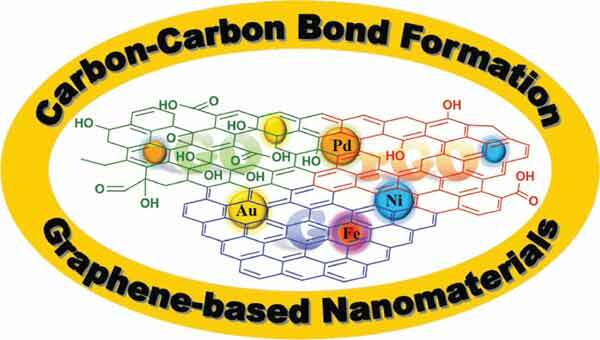 Keywords:Heterogeneous catalysis, carbon-carbon bond formation, nanomaterials, graphene, graphene oxide, reduced graphene oxide, C-C coupling, organic synthesis. Abstract:The carbon-carbon bond forming reactions are of central importance in organic synthesis and routinely practiced across the world in both research laboratories and industrial processes. Since its initial discovery in 2004, graphene, a two dimensional nanomaterial bearing a single layer of sp2-hybridized carbon sheet with hexagonal packed lattice structure, has received significant attention worldwide. Owing to its exceptional physicochemical properties such as thermal stability, ease of structural modulations, high surface area leading to considerably high mass transfer as well as high loading capacity of nanoscale structures, and easy recovery and recyclability, graphene domain and/or graphene- based nanomaterials (G-NMs) can be considered as the materials having a self-assembly of very likable or ideal properties for catalytic applications. Not surprisingly, therefore, the last few years have witnessed the significant progress in the fabrication and exploration of a variety of G-NMs as alternative heterogeneous or pseudo-homogeneous catalysts in organic synthesis. This review highlights the significant advancements in the synthesis and an up-to-date catalytic applications of G-NMs in carbon-carbon bond forming reactions with an emphasis on coupling reactions.